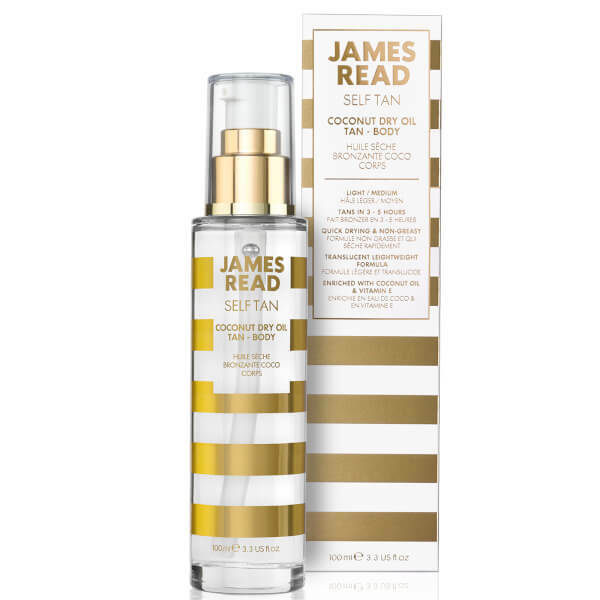 Achieve glowing perfection with James Read's Coconut Dry Body Tan Oil; a lightweight, translucent formula with a luxurious Rose fragrance and a smooth, flawless finish. Enriched with deeply moisturising Coconut Oil and antioxidant-rich Vitamin E, the non-greasy self tan works to nourish and protect skin, whilst delivering natural-looking, streak-free colour that lasts up to five days. Quick-drying and easy-to-use, you can control the depth of colour and build a gradual tan that intensifies with each application. Shave/wax 24 hours before application. Thoroughly exfoliate skin. Immediately prior to application, moisturise dry or rough areas including knees, elbows, ankles and feet. Pump into the palm of your hand or onto a mitt and apply to your body in circular, sweeping motions. Ensure the product has been applied all over, leaving hands and feet until last using leftover formula. Wait until the skin is touch dry before dressing. Avoid contact with water for 3-5 hours then rinse. Aqua (Water), Glycerin, Isopentyldiol, Dihydroxyacetone, Dimethyl Isosorbide, PEG-40 Hydrogenated Castor Oil, PEG-7 Glyceryl Cocoate, Citric Acid, Parfum (Fragrance), Sodium Metabisulfite, Tocopheryl Acetate, Xanthan Gum, 1,2-Hexanediol, Biosaccharide Gum-4, Cocos Nucifera (Coconut) Oil, Sodium Benzoate, Potassium Sorbate, Coumarin.